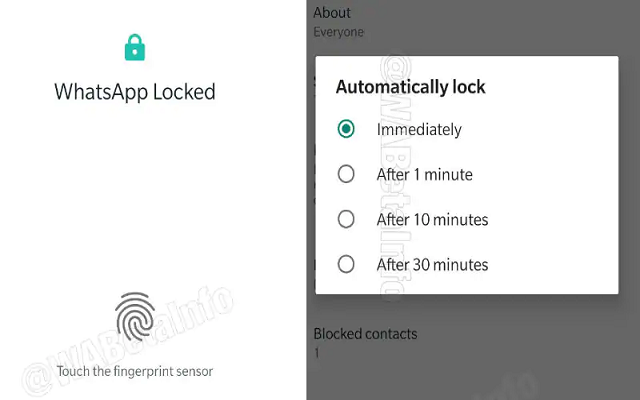 WhatsApp Fingerprint Authentication Feature has been spotted on Android beta app to version 2.19.83. The latest update shows that it comes with a lot of progress. WhatsApp has been working on this feature since a while now. Beta tracker WABetaInfo has shown how the Authentication feature can be enabled in Settings by sharing the screenshots. It has also shown how the interface will look like. However, this feature has been disabled by default, so it will not be available for beta users at the moment. According to WABetaInfo, the Authentication feature will allow you to lock your account and unlock it using a fingerprint sensor. You can enable the feature in the Settings. So you have to go to Settings >Account >Privacy > Use Fingerprint to Unlock. Once you enabled it, WhatsApp will register your fingerprint. After that, It will then ask in case you want to lock the app immediately. WhatsApp will show a sign that will indicate to the users that they should unlock the app using fingerprint authentication. If the app is not unlocked after multiple tries then it will show you an error. As we have told you that this feature is not available on the latest beta version 2.19.83, so you won’t be able to see it. It is to be expected that this feature will come in the next updates for beta users. More interestingly, this feature is already available for iPhone users in the stable version of the iOS app.